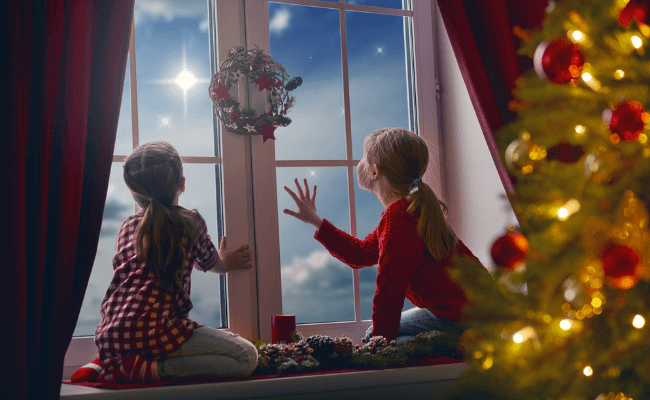 Looking for some simple Christmas traditions to enjoy with your family! Here are 25 of the best family Christmas activities to make your holidays special! 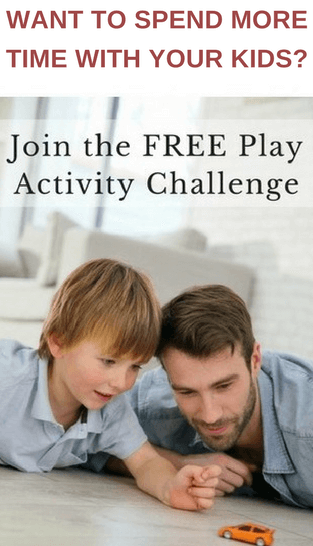 They are all really easy to set up and your kids will love them! Pin now and choose a couple to start making memories this year! Every year, a few weeks before Christmas, my parents took us out into the countryside to pick holly. Armed with leather gloves and pruning secateurs my parents sent us kids out ahead to scout out the best holly bushes.We would fill a bag with the stuff to decorate the house. Holly picking was an important part of my Christmas growing up. It wouldn’t have been Christmas without that outing and it will always evoke very happy memories for me. It’s been 50 years, but I can still remember dressing up warmly and and the thrill of excitement, because it meant Christmas was coming. I raised my boys in a place where the winter is too cold for holly to grow, so we enjoyed different Christmas traditions. 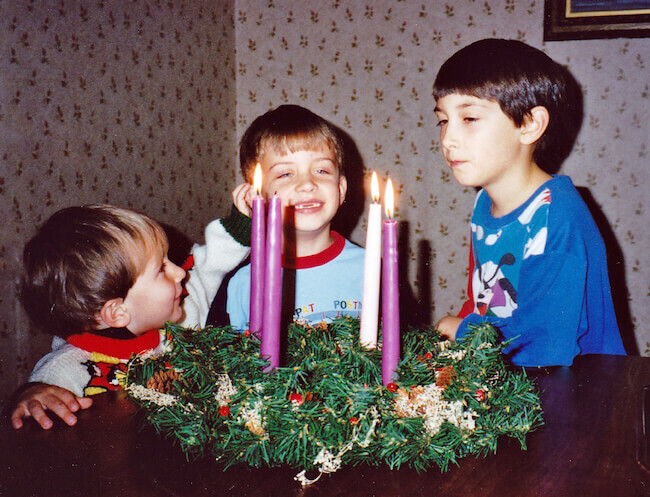 Every year, four weeks before Christmas, the boys and I would get out the Advent wreath and set it up with four candles. It was the beginning of the holiday season for us. Each Sunday after dark we would dim the lights and light the candles. I remember how excited the boys got as December progressed. Look at the picture below. See the smiles? That is the beauty of family traditions isn’t it? Those repeated rituals that create closeness and foster a feeling of belonging. I loved how excited my boys got for the traditions we created for Advent and Christmas. We made gingerbread houses, enjoyed favorite snacks as we decorated the tree, and had a corny Christmas playlist on permanent replay. It made the season truly magical and built memories that my boys cherish. Quite simply any Advent or Christmas activity can evolve into a wonderful family tradition. You can build upon them as your children grow, but often the best ones are really simple. A tradition doesn’t have to be elaborate or expensive. It is just something you do every year. 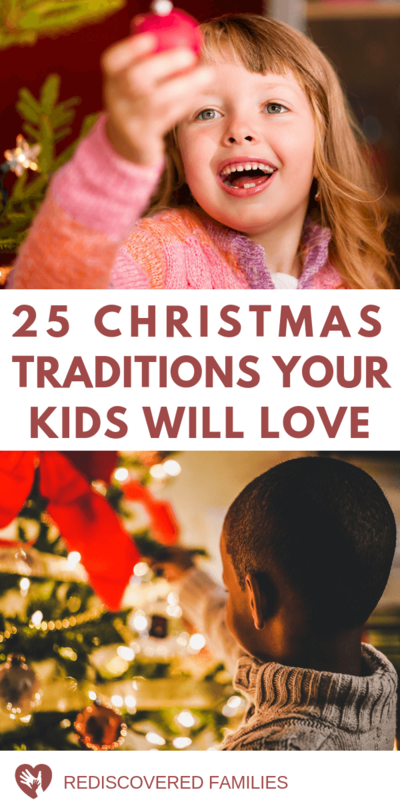 Choose traditions that you will enjoy as much as your children, so that it doesn’t become a chore for you. I have gathered together 25 really simple ideas to inspire you. December is usually a hectic month, so I have tried to choose things that require little to no preparation. Most of them won’t cost you anything either! You may find that you are already doing many of these! Cut out paper snowflakes or make paper chains. Go for a walk (or drive) to admire the lights. If you have a nativity scene, set up the stable in a central location on December 1st. Retell the story of the journey Mary and Joseph made to Bethlehem. Start Mary and Joseph on their long journey by placing them some distance from the stable. Every day have your children move the figures closer to the stable, until they arrive on Christmas Eve. Wrap up warmly and go stargazing. Have a decluttering session to make room for gifts. Give everyone a box and ask them to fill it with toy, book and clothing they don’t use anymore. Donate anything that is still in good condition. Set aside the Christmas cards you receive and open them as a family each evening. When you have finished reading all the greetings invite children to cup their hands together in front of their mouths and whisper, “Christmas love. Christmas blessings.” On the count of three everyone blows the blessings out to all the people who sent cards. Play a round of Holiday Charades. Tell the kids a story about one of your special Christmas memories. Read a Christmas story while you snuggle under a blanket. Find Rudolph’s nose! Hide a small red ball in the house. The person that finds it gets a small treat and hides it the next day! Go shopping to buy items for the food bank. Let each child pick out several items. Create a holiday playlist with your kids that your family listens to in the car or at home. Drink Hot Chocolate and listen to your play list! Have a Christmas picnic! If you live in a warmer climate, have your picnic outdoors, and if it’s snowing where you live, picnic by the fireplace or another warm place indoors. Get a few bottles of shaving cream and have family members make a Santa beard on their face. Crazy right? Don’t forget to take pictures!!! 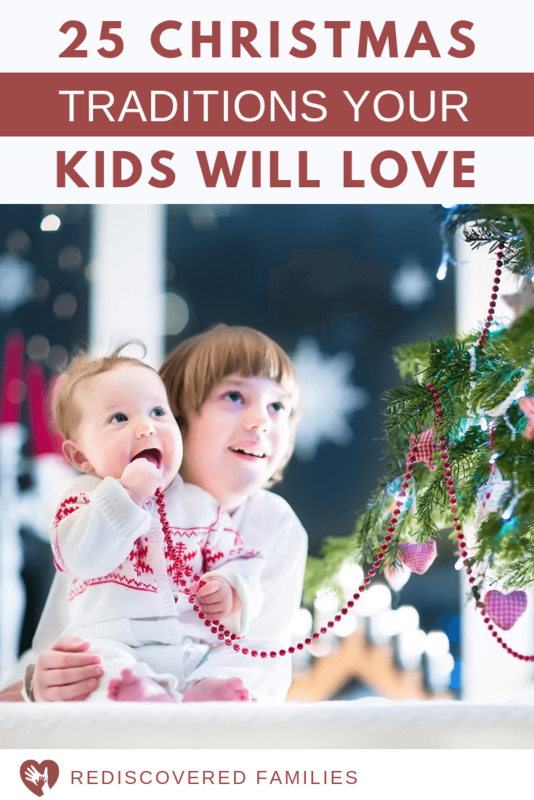 Hang Mistletoe and use it often, especially when your kids are watching! Put a blanket under the Christmas tree. Lie on it with your kids and look up at the lights. Have your nightly story time next to the Christmas tree. On Christmas Eve pile up blankets, pillows and sleeping bags near the Christmas tree. Read your favorite Christmas story and turn off every light except for those on the Christmas tree. Turn off all the lights in the house, except for the tree lights, and have a sing-a-long with your favorite holidays songs. I hope that this list has given you some ideas that will be easy to implement. Maybe you can choose a few to add to your family memory-making activities this year. Have fun! Follow Rediscovered Families’s board Christmas on Pinterest. Help me add to this list. What Christmas traditions do your family enjoy each year? What family traditions do you remember from your childhood? It sounds as if you are starting some wonderful traditions Isabella. Have fun! What a sweet list of simple Christmas traditions. I loved the decluttering one. What a wonderful way to teach children about giving. This year we have a child back in the house, our sweet baby granddaughter. She will be nine months at Christmastime. I have a beautiful Fontanini wooden advent calendar. I really liked your idea of telling the story of Mary and Joseph with each day of Advent. What a wonderful tradition for me and my granddaughter to do. So glad I stopped by today. Thanks so much for sharing! How wonderful to have a granddaughter. Now you get to enjoy all those traditions over again. Those Fontanini advent calendars are beautiful. It will add so much to your Advent waiting. I love Christmas traditions. We do quite a few and every year the children get excited about doing the again. Good ideas here. It always amazed me how excited my boys got each year. One of my happiest memories is having my Mom tell me about her childhood. A few years back she wrote down a lot of her memories ofr me. It is such a wonderful gift. I enjoyed this list! I am all about the simple traditions. 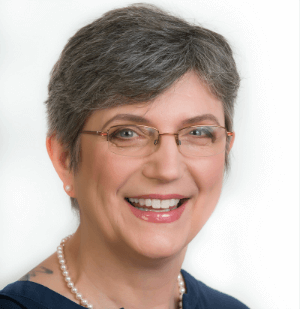 I am featuring your post on this week’s Tuesday Talk. Thanks for linking up your post with us! Thank you so much Emily. Doesn’t it sound like fun? I run the children’s programs at the local library. I think I might do that one with the preschoolers!A small nativity set does help children learn the story really well. Playmobil has a lovely one that kids can play with. I loved the idea of reading our Christmas stories under the tree! 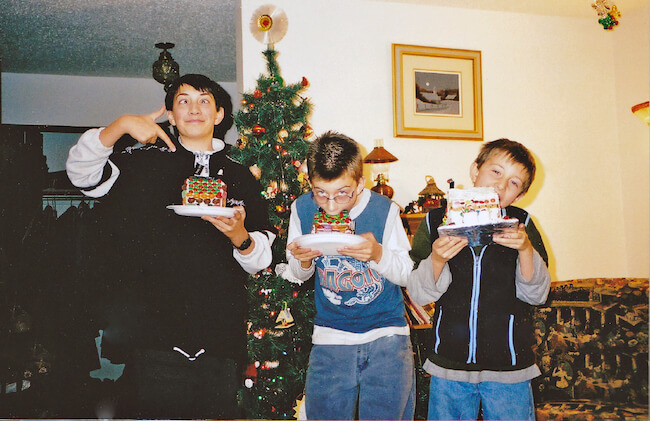 Each year my sons and I bake together – gifts for their teachers & our neighbors. Every year it is something different – holiday bark, cookies, mason jar gifts. Our best was for my younger sons pre-k class. His teacher grew up in South Africa so we looked up traditional recipes online and made a South African milk tart. It was something we never would gave found/made for ourselves. Thanks for the article it is great! I love the idea of baking together and what a lovely thing you did for your younger son’s pre-K teacher. One of the most popular teacher gifts my sons and I made was jars of cinnamon sugar. They were the easiest things ever, but the teachers loved them. Thanks so much for taking the time to comment. These are some great ideas. I’ve been looking for new traditions to start doing. I’ll be saving this for reference for sure.